A recent press release has unveiled that the Filly Funtasia license has been given to Hasbro, who have stated their desire to "incorporate Filly Funtasia into one of [their] existing popular brands." After years and years of unfortunate events regarding the development process of Filly Funtasia, it seems like it has finally found some ground to stand on! 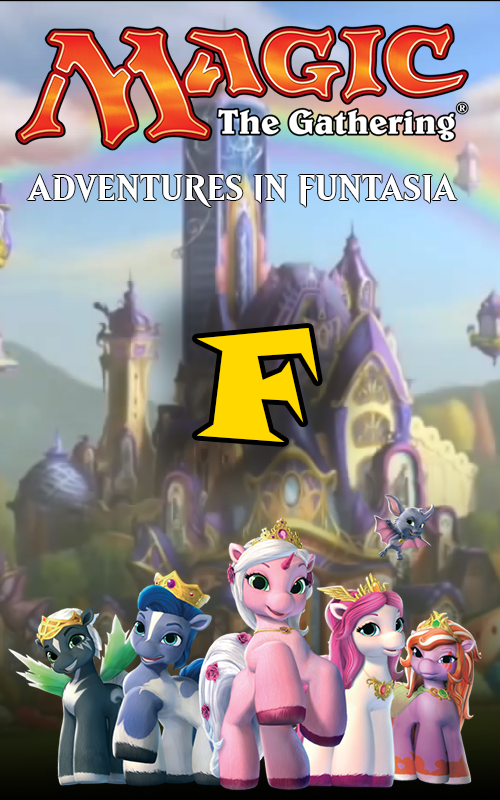 Filly Funtasia is no longer a standalone animated series, but a valuable addition to Hasbro's long lasting franchise full of magic and enthralling locations, both colorful and spooky. That's right, Filly Funtasia is entering the Multiverse of Magic: The Gathering! What, did you expect something else? The move from a cartoon show to a trading card game makes sense, considering that Filly is no stranger to the concept. Old Filly figurines came with bio cards that doubled as playable cards with stats and rules. It is not clear if Hasbro has decided to pay tribute to that discontinued practice, or if the decision to move to MTG is based on other factors, but nonetheless, it is heartwarming to see the old format return, thoroughly using the potential of Filly Funtasia. The press release was kind enough to share a synopsis of the background story for the Adventures in Funtasia set, as well as show us 21 cards that are included in the set! You can find all of this below. Funtasia, a realm forgotten by time. Its inhabitants are suffering from an endless stasis, an eternal trap in limbo. One of the students of the realm's academy, Lynn, has had enough. The salvation was promised years ago, but if it won't come to them on its own, then she will make it come. Lynn has gathered the dark crystals and used them to open a cascade of portals, seeking a force that can "help" the Fillys. The witch barely cares what happens to Funtasia - as long as something happens, her desperate plan will be worth it. But what exactly will happen to Funtasia, now that it is a playground for the forces beyond its scope?.. Adventures in Funtasia does not have a solid release date yet, the press release simply stating "in 2018." But I'm sure this date won't get pushed back. Hopefully we will see more sets (or even blocks!) about Funtasia in the future. And if Magic: The Gathering eventually gets its own animated series, it might feature Funtasia, finally giving us Filly Funtasia in a form that resembles the old planned show. That would be one crazy loop!